The Inner Wall seen from the east facade. 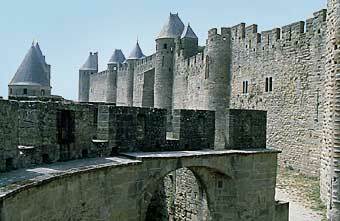 s a result of the events following the struggle between the Trencavel viscounts and the Capetians major reconstruction work was undertaken in the fortified town of Carcassonne. These greatly changed the appearance of the fortress stamping its defensive works, castle and cathedral with the mark of the Ile de France engineers and artists. The first projects were carried out following the creation of the royal senechalsy (1226) and were interrupted during the siege of the city in 1240. The castle was fortified. Construction of a second line of defence intended to match the ancient wall was begun. With barbicans and 16 towers it covers more than 1,500 m. The lists which then consisted of an open space between the two ramparts, were designed to perfect the defences. At the same time, in order to adapt the fortress to new artillery techniques, sections of the ancient ramparts were renovated, raised and crenellated; loopholes and arrow slits were then made in the gallo-roman bays that had been filled in.